Today the weather in Westville is partly cloudy to mild with a likelihood of strong wind in the afternoon. I know this because I felt the stiff breeze and saw plenty of cloud when I was on the roof earlier taking photographs of our new weather station. Having never purchased dynamite, I really wouldn’t know if it comes in small packages, I can however tell you that weather stations do. When we first discussed implementing a weather feed to our website, I somehow imagined a whole host of meteorological equipment and admittedly was surprised, when it arrived in packaging not much bigger than an A3 ream of paper. Nonetheless, it is an amazing piece of equipment that’s proving very effective. 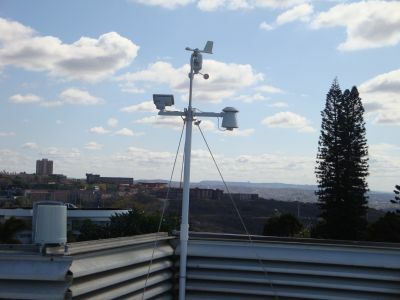 It wasn’t too difficult to install and we now have a live weather feed from the top of our building in Westville. The Association exists to represent the interests of members, as well as to provide them with specialist support services to assist them in the successful running of their businesses. Weather can enormously impact on project deadlines and while there are plenty of weather sites one can refer to, ours gives up to the minute information from a specific point in Westville, enabling local contractors to fathom from there. Our newest web application can be accessed by clicking on the Weather Centre icon located on our home page or, for those who would like the direct link, http://www.masterbuilders.co.za/weather.htm. Have a look and let us know what you think.